Did you ever notice that when you look at something you always want to know why? What made them do it? Why go through it? I know I do. Is it because we want to know why we don't do it too? Or we want to know if our desire to do it has enough logical background and case experience to go ahead with the idea ourselves? Or is it just because the human animal is the most curious and entertaining of all the earth's beasties? ..... To elope. Yup. Crazy, romantic, half-baked and all true. There was a bunch of family horse hockey on both sides of the aisle. We were making ourselves miserable trying to figure it all out. Somewhere along the lines we tossed out the idea of eloping. We were kidding at first but at some point it dawned on us. This was OUR wedding. It was an expression of our commitment to each other. Sure you want to express that in front of your family and friends but with new technology there are plenty of ways to share. Still toying with the idea we naturally turned to where. Vegas was NEVER - let's just repeat that for clarity - NEVER - a consideration. Niagra Falls? Closer but too touristy. Grand Canyon? Red Wood Forest? We turned it round and round. Nothing just felt - right. We tried spinning the globe and blindly picking a spot. Pago Pago. Little web research and it turns out it's a United States territory. Bonus. The furthest United States territory from the mainland - that would make a point to the families. A little further research and we found it would cost nearly $5000 in air flight. Wow. Would rather have more to show for our 5K. The clincher? It smelled like fish nine months out of the year. Not just a little. Apparently it is completely overpowering. Back to the drawing board. Fortunately, not long after we were crying the blues to our friend, Andres, and he told us about the Quaker license. Quakers don't have traditional services. They stand up and share. When they marry, they "stand" before their friends, family and fellow parishoners and annouce their marriage. In other words - no officiant (minister/district judge/whathaveyou) That meant quite literally we could go whereever we wanted as long as we proclaimed our vows in front of two witnesses. You must specifically request a "Quaker" license. There are two types. The more common one - which requires an officiant - is what you will be automatically issued if you do not request the other type. It does not matter what county you get your license from. When we did it only Dauphin County offered it. Perry and Cumberland claimed they did not although the woman at the Dauphin office (State Capitol) said all the counties offered. Maybe not all counties are aware they offer it. It might be worth asking someone else in the office. You must declare your vows in front of the two witness who will sign your license. You do not have to have them at the "ceremony" if you wish that to be totally private. Your vows must clearly declare your intention to marry so your witnesses have no room for doubt about your intentions. This type of license may not still be available. It wasn't long after that information we said "Let's get a camper and go whereever we want." 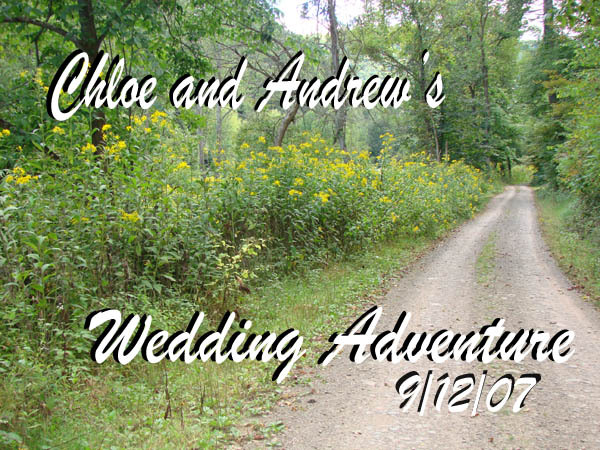 Chloe (and only Chloe, really - no really) was drawn to Airstreams and so the Great Wedding Adventure began. The cover from the DVD we sent friends and family. We ran into the usual hurdles finding the right trailer. Best advice - take your time and wait until the perfect one comes along. 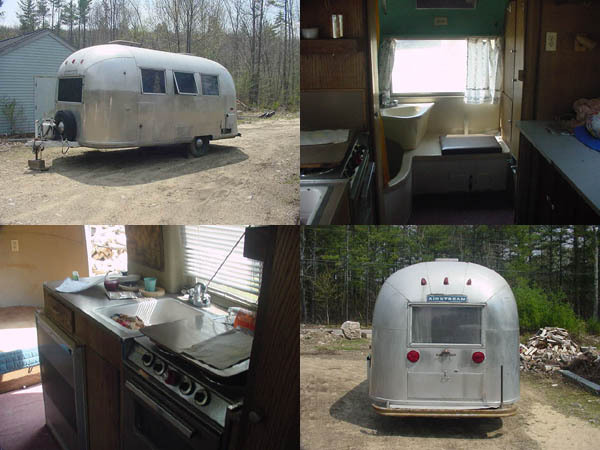 Each time I would find an ad I would click over to the Vintage Airstream Photo Archives to look at shape and layout. Naturally my first instinct was to look on ebay. TIP: Don't do that. You rarely get a good understanding of what's going on especially with the floor. 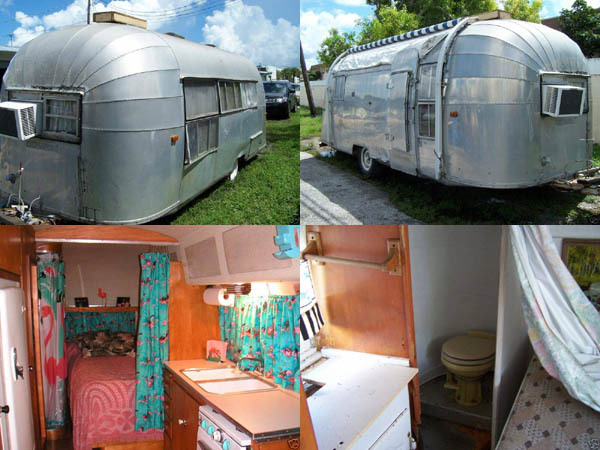 Vintage Airstreams frequently have a problem with the wood floor rotting out - especially around the toilet. Before a certain model year (I can't remember when - late 70's?) the only proper way to completely replace the floor is to remove the top, pull out the bottom, replace the plywood and rivet the top back on. Others have tried with varying success to patch the area. Read more at Airstream Forums. Anyway, my first try was one on ebay. I put on a bid then the listing was canceled early. Second try was 66 Globetrotter through a reseller in Georgia - sold out from under us. I guess cash in hand is better than a promise of a check being sent tomorrow. Probably for the best. He wanted $8k and we would have ended up doing a lot of the same work we did anyway. Third try was a 57 Caravanner - owner placed an ad, said he wanted to sell, then wouldn't return calls. Flake. Too bad because I really liked the layout with the double bed in back. The floor was already replaced, frame painted and the inside gutted - ready for custom cabinets. Various 57 Caravanners. Check out the windows and door. Success came through the classifieds on Airstream Forums. Vern, the previous owner (forum handle: 53FlyingCloud), put up an ad for a 64 Globetrotter that he bought in 2004. He chronicled the work he had done to it on Airstream Forums. After reading all 16 pages of his thread , I felt comfortable that I knew the condition of the trailer. Experienced Airstreamers are laughing. For those new to vintage Airstreams, you never know what you're getting into until you tear it apart or camp in it for a season. I contacted Vern. We set up a meeting time and we were off to Vermont to pick up our new (to us) $3500 Airstream. Loading up for the new Jeep's first tow. At a rest stop on the way to VT. Chloe assures me this was not a comment on getting married. I'm not so sure. BTW: We were both growing our hair out for Locks for Love. Back home. Reality setting in. What a cute pa-toot. That's every bit as nerdy as it sounds in my head, isn't it?